It’s sort of like looking at Luca Bear, my daughter’s dingy teddy-bear lovey with the frayed bowtie that she has been sleeping with since she was 13 months. One look at him and you know that thing has been on the receiving end of some serious love. 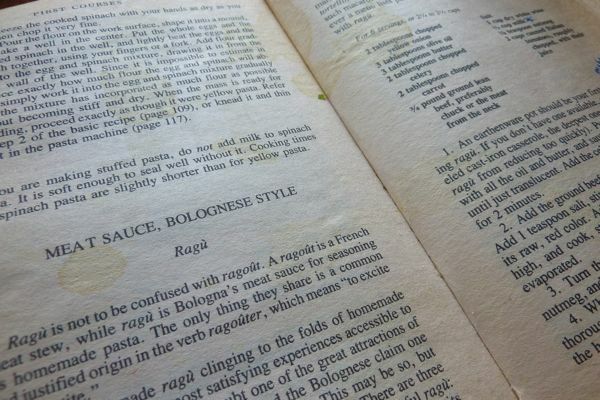 The summer I first bought CIC, I tried out a few of the recognizable recipes — Tomato Sauce 1, Tomato Cream Sauce, Blender Pesto — making some real knucklehead comments in the margin as I went along. “Too garlicky” I wrote after adding three cloves of garlic to a tomato sauce that didn’t call for any garlic at all. Improvising with a Marcella recipe, I’ve since learned, is not something one does, unless one does not want to learn how to cook. You make the dish exactly the way she tells you to. In a nod to her shortcut-obsessed American audience, her headnotes are studded with phrases like “if you insist” and “if you are so inclined” (Fettucine with Gorgonzola Sauce: “You can try substituting domestic gorgonzola or other blue cheeses, if you are so inclined, but you will never achieve the perfectly balanced texture and flavor of this sauce with any cheese but choice Italian gorgonzola”), but the effect is the opposite of liberating. It makes you desperate to not disappoint her. (There are also many less passive instructions such as this one, under Mayonnaise: “I can’t imagine anyone with a serious interest in food using anything but homemade mayonnaise.”) The ingredients she uses in her recipes are all basic staples of any kitchen — butter, ground beef, salt, onions — which means that in order to yield the kinds of dishes that have earned her exalted status in the food world, it is absolutely imperative that you do not deviate from what’s written. For Hazan, who was trained as a biologist and went on to teach cooking classes in her New York apartment, it’s all about technique. When I do what I am told (literally leveling off two tablespoons of chopped onions), not only do I find myself with insanely delicious dinners I’d be proud to serve to Grandmas Turano and Catrino, but I find myself a little smarter in the kitchen. Her bolognese, which you are looking at above, was the first Hazan recipe that we fell in love with for this reason. “It must be cooked in milk before the tomatoes are added,” she wrote. “This keeps the meat creamier and sweeter tasting.” And then: “It must cook at the merest simmer for a long, long time. The minimum is 3 1/2 hours; 5 is better.” We, of course, always do five. We made it last week with fettucini, but Marcella — and any Italian — will tell you that tagliatelle is traditional. Because the sauce can be made ahead of time, it makes an excellent dish to serve dinner guests. 1. In a Dutch Oven or large heavy pot, add the onion with the oil and butter and saute briefly over medium heat until translucent. Add the celery and carrot and cook for 2 minutes. 2. Add the ground beef, crumbling it in the pot with a fork. Add 1 teaspoon salt, stir, and cook only until the meat has lost its red, raw color. Add the wine, turn the heat up to medium high, and cook, stirring occasionally, until all the wine has evaporated. 3. Turn the heat down to medium, add the milk and the nutmeg, and cook until the milk has evaporated. Stir frequently. 4. When the milk has evaporated, add the tomatoes and stir thoroughly. When the tomatoes have started to bubble, turn the heat down until the sauce cooks at the laziest simmer, just an occasional bubble. Cook, uncovered, for a minimum of 3 1/2 to 4 hours, stirring occasionally. Love, love, love Marcella Hazan! We make this dish on many Sunday winter nights. Her “Chicken with Two Lemons” is also a staple in our house. I’m feeling inclined to use “if you insist” in much of my dialogue for the foreseeable future, especially whilst dealing with my pre-teen. Will keep you posted on how that goes. In the meanwhile, I’ll add this recipe to my “Must Try from DALS” List pronto. This sounds delicious, we had your back-pocket bolognese last night. I’ll add this to my list. Just one thing. In your ingredient list above, the wine is missing. I tried to get it from the photo of the book, pretty sure it says dry white wine, but 1 cup or 2? Thanks so much! sounds devine!.. but you may be missing the amount of wine she suggests. cannot wait to try this recipe out. If anyone is looking for this book, “Essentials of Italian Cooking” combines this book with “More Classic Italian Cooking” in one volume and updates them. Boy you guys are quick! It was one cup dry white wine — sorry about that! All fixed in recipe now. Anne – Thanks for pointing that out re: Essentials. I have that one, too, though I always choose to use the cheapy paperback. Something about the yellowed pages…. I know you say not to mess with her recipes. What if we don’t eat red meat can we substitute ground turkey or is that just the worst question to ask? Just wondering…how many people does this serve? I just made the minestrone from Essentials yesterday. If love could be embodied in a food, it would be that soup (although based on that analysis, one of my kids accepts my love and the other scorns it in favor of a peanut butter sandwich). We also constantly turn to chicken with two lemons when we don’t want to think about what to do with chicken. I also LOVE Marcella Hazan, and as soon as I opened her book got a sense of “must do exactly as I am told.” Your sentiment of not wanting to disappoint is exactly it! Thank you. My favorite is the Tomato Sauce with Onion and Butter. It’s just SO simple, tasty, pure and extracts the very best flavors from each of the 4 ingredients. 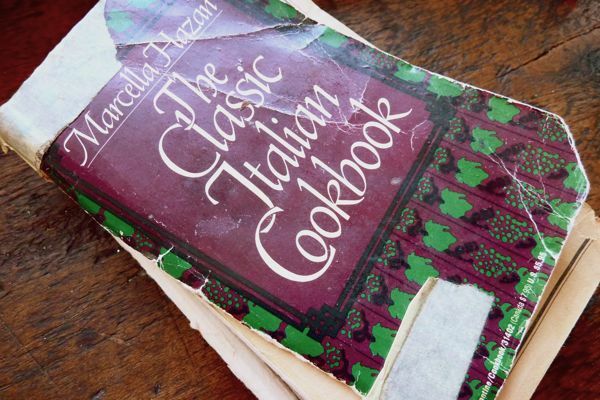 I have the exact revelation after my first student trip to Italy…Only I somehow ended up with a hardcover copy of The Frugal Gourmet cooks Italian. I don’t remember much from the book but I venture that it’s not quite the same level as Hazan! I bought that book for a friend who happens to be dating an Italian fellow. She gushes about it at every turn. I kind of feel the same way about my little Fanny Farmer paperback. There is something to be said for a classic cookbook. And I will follow every instruction. There is nothing like following a recipe to the letter the first time one makes the dish. That’s how you hone technique; how you can make a dish your own. Follow the recipe! Simple sounding ingredients and over 3 hours on the stove top sounds like a win to me. And great to note about the dangers of Marcella improv. Sometimes I get carried away with that sort of thing. So I’ll have to tell myself to knock it off and just follow her instruction! That looks amazing! It seems so simple, too. Any thoughts on doubling? Can you be true to Marcella and make twice as much? Wow! Meghan! I don’t know about doubling — I would never dare it. Just kidding. I’m sure it will work, but it probably will take longer for everything to absorb. Jill – this one above serves four adults very comfortably. Oh, thank you for reminding me about this. The question is, whyever should I NEED to be reminded about it? PS I would also just like to add that two people have emailed me directly (and separately) today about this post with the same comment: “This was the first grown-up meal I learned how to make for dinner guests.” I totally agree — that was us, too — and I think it’s important to note to all you fledglings out there! SUPER EASY and SUPER IMPRESSIVE! I once made the lasagne from her MARCELLA SAYS… cookbook, complete with making my own spinach pasta from scratch. It took two days and much cursing, but when I sat down to eat it, I truly thought, “Oh. THIS is what lasagne is supposed to taste like.” Every lasagne I’d ever had instantly became almost unrecognizable as lasagne. A couple years later, I made it again, with store-bought refrigerated pasta, but still making the extraordinary sauce from scratch. I expected it wouldn’t taste as good, but…”pedestrian” doesn’t even begin to describe the dull result. I will never deviate from any of her instructions ever again….and may not make the lasagne again for a decade :-). I love that your book is tattered and torn. I do not have this cook book. I think I must buy…soon. : ) Thanks for sharing. Do you have to put the milk in? Just made this recipe for my toughest critic and he loved it! Thanks for a great recipe! I have made this recipe so many times. There is just nothing else quite like it. @Laura – yes you have to use the milk! It softens the meat and gives the sauce a wonderful consistency. I made this last night and it was Auh-MZING! Thank you! 5 hours and yes, I deviated…. used 2% milk and added a little more milk and tomato juice at the end because it seemed a little dry. Everyone loved it all the same. 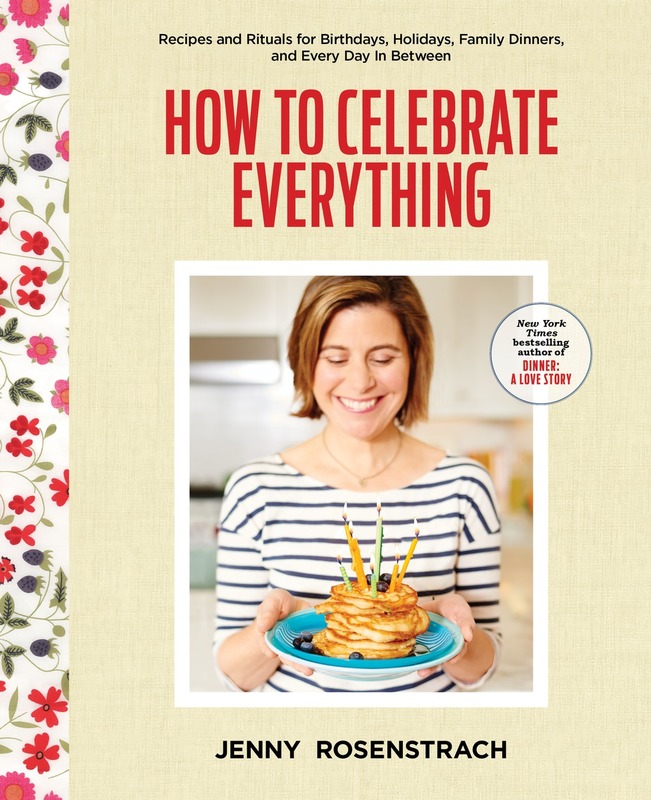 I have been hoarding amazon.com gift certificates from Christmas and my birthday and I just ordered a Le Creuset dutch oven and this book, can’t wait to try them out! Just a warning, the recipe from Essentials is different from the one in Classic. It calls for a lot more vegetable matter and is in my opinion not as good. Could you follow steps 1-4 and then transfer to a crockpot to finish it for the 5 hours? Just to add… I bought this book (used and with yellowed pages, haha) the day after you posted this entry. I made the Pasta e Fagioli soup in it… um! To die for! There is a mistake in the recipe. The milk should be done first, then the wine. According to Marcella, the milk coats the meat to protect it from the acidity of the wine and the tomatoes. After the milk has evaporated all away, then you grate the nutmeg, THEN you add the wine. How long does it take for the wine to evaporate in step 2? How long should I cook it before moving on to step 3? Thanks! Could you address Joe’s comment from May 26? He said the recipe has an error….that the milk should be added (cooked to evaporate) and THEN the wine. Could you please address? Thanks! Help! I’m five hours into this thing and it seems so fat-heavy. I doubled the recipe and doubled the fat as well. I”m wondering if it’s needed for the pasta or if I should drain some of it off? Any thoughts? oh no! I started this and didn’t read all the comments! I added wine first then milk. I just checked online at Marcella recipe and it says milk first then wine. Hope it comes out okay… I’ll let you all know in a few hours. 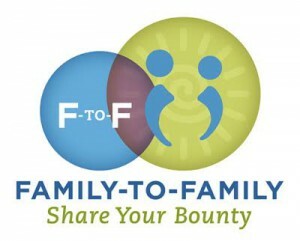 Jenny – I have always made it with ground turkey and my husband, a full on carnivore, is very happy with it. The milk makes the turkey tender and rich. Made your Lazy Bolognese last night on a very cool late summer evening. Nothing less than amazing! The aroma of fennel seed took me right back to the meat sauce my Mom used to make for us when my siblings and I were kids. It will most certainly be on the regular rotation throughout autumn and winter. I too wonder which is correct, wine or milk first? I have been making it per Jenny’s instructions and it is wonderful, but I would love to hear which is correct. I also have the problem that when I double this there is WAY too much fat. I tried increasing the cooking time by quite a lot, but it was still too much. Now I use only a little more butter and EVOO when doubling and it works much better. I found this because of your end of year post (some good reading there!). I make Bolognese from another source, but they must have been inspired by Marcella because the ingredients and instructions are virtually identical. The only difference is that they call for 6 ounces ground beef and 6 ounces ground pork. The first time I made it I couldn’t find ground pork, so I used Italian sausage. I dream of this stuff. It is SO good. I made this and it smelled divine but when tasting it it was incredibly salty. I didn’t even add a full TBS per the ingredient list. I am guessing perhaps it was the tomatoes I used…do you use a specific brand? I used canned tomatoes from Trader Joes. I added a potato to remove the overly-salty taste and now am happy with it. thanks! Is there a way to substitute or omit the white wine? Thanks! 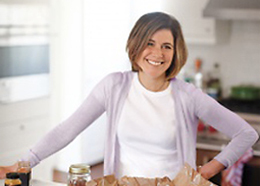 While it is absolutely true that following Marcella’s recipes exactly will get you wonderful results, I think that she would be the first to admit that the only rules in great Italian cooking are using good ingredients and treating them well (and, perhaps, not using too many of them)! Unlike French food, which is fairly well codified–a dish with a particular name made in one town will be pretty similar to the dish with that name made in a town on the other side of the country–Italian dishes differ town to town and even house to house, precisely because they are so dependent on available ingredients. You can make this ragu, for example, with white wine or red wine or no wine — but don’t expect the results to be the same if you change the ingredients. Who knows, you might like them better? I’ve got a pot of this on the stove right now! Does it freeze well? i made this saturday night, using the recipe from the 1991 “essentials” book by hazan. she does call for milk, then wine, and a lot more vegetables. i wonder why she changed it? in any case, doubling took a LOT more time (what with all the evaporation), but it was out of this world delicious!! it didn’t make as much sauce as I would have thought, though, for the amount of time i put in at the stove. sadly, very little left over after serving 4 adults and 3 small children. Regarding the milk/wine debate:In Essentials, the recipes have been modified to reduce their fat content. I would think that in the original recipe (the one printed here) there is already enough fat from the butter and oil to coat and protect the meat from the acidity of the wine and tomatoes. The extra fat from the milk isn’t needed to protect it from the acid, whereas it is in the modified, fat reduced recipe. Perhaps a silly question — salted or unsalted butter? And how much longer did the recipe take to reduce when doubled? I have five adults and a teenager for dinner tonight and want to be sure I have enough to serve and enough time to prepare! I think you should almost always use unsalted butter. you will adjust for salt later anyway. As for the length of time when you double the recipe, it took me a full 5 hours on the stove. I didn’t wait for total evaporation bc i wanted to get the whole thing simmering, so you may even want to allow for more time. it really was delicious. i can’t wait to make it again! Thank you!! I’ll be hard pressed to let it simmer for 5-hours… I’m already leaving work early to get cooking, but perhaps I can 1.5 it and meet in the middle. Do you think the recipe as-is is too small for 6 people, even if 2 of us have small appetites? Now I’m panicking. 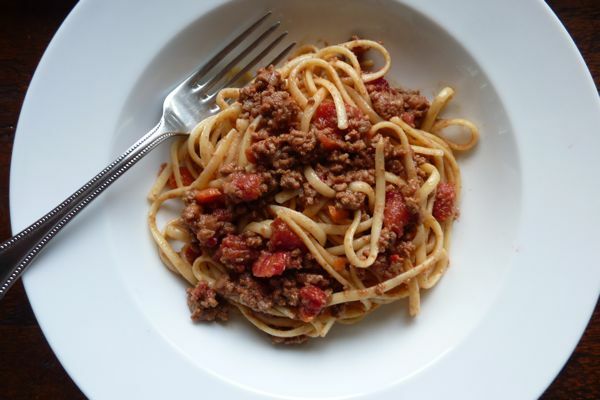 have you seen the recipe for Lazy Bolognese? It’s really delicious, too, and doesn’t require all the simmer time. I’d try that. And it’s easy to double. Otherwise, this recipe as-is only makes 2 cups of sauce. It’s up to you. Good luck! Is that the one in the DALS cookbook? ANOTHER wildcard is that it cannot have garlic (I know… I’m becoming needier and needier), so would you recommend going the lazy route and just omitting it? If not, I might just stick with the original. Sorry and thank you! I think in DALS it’s called “back-pocket bolognese?” or is that on the website? in any event, yes! skip the garlic! i would go the lazy route (even though there isn’t much lazy about it. you are making HOME-MADE sauce…from scratch!!!). your guests are lucky!! I learned to make this as a student in Bologna. It’s the dish I make when I want to lure my adult kids home. I always make enough for them to take away. If you want to really blow your mind, make the lasagna verde in that book. It uses this recipe for meat sauce. If you do, buy the fresh pasta from a shop but make the rest yourself. Have them roll it thinner than usual. Use good parm. I would say it will spoil you for traditional American lasagna, but the two are so different that’s not really true. I needed the perfect bolognese recipe, and my friend, Lisa, sent me here, and what a treasure. Simmering now, and I can’t wait. I could have sworn that this recipe called for half pork and half beef…. Liz, I’ve seen elsewhere that she says you can make it with 2 parts beef to 1 part pork if you want a richer tasting sauce. So for one recipe it would be 1/2 lb beef and 1/4 pound pork. Delicious this recipe made me dig out my copy of CIC it’s like a found a long lost friend, thank you. I have this cookbook which is now dog eared and yellowed. The after notes for this recipe recommend 1/4 lb pork and 1/2 lb beef which I have always done and love. This recipe is a keeper for sure. Also from this book is clams with linguini or fettucini and it is fabulous. Surely you have the steps reversed? Marcella says to cook the meat first in milk, THEN add the wine and tomatoes… Right?? This guy has the same old book I do (copyright 1973), with the same exact recipe — only when I happened to browse this recipe instead of getting out the book one day not too long ago did I ever hear of this milk-before-wine thing. For sure this book — my bible for 35 years — says wine before milk. I’d love to hear the story of how/why she changed her mind, if this is not in fact some huge internet copy-the-wrong-thing-endlessly fail. I’ve now tried it the milk-before-wine way, and … not too much difference, tbh. but I’d love to hear the story, including WHEN these steps got transposed.